The concept of a caretaker government during the interim period, when the term of an elected government ends and elections are held for forming a new government, is not any new addition in the practice of democracy. In fact all the countries following the Westminster style parliamentary system practice this concept of caretaker government. When a new general election is scheduled and a date is fixed, the outgoing government remains in office but in effect it takes the form of a care taker government. This practice of the concept of care taker government by the outgoing elected political government is followed in a political culture where trust and confidence exists among the major political parties about the fairness of entire electoral process. 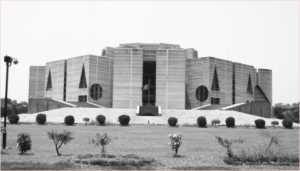 With the enactment of Constitution 13th (Amendment) Act, 1996 Bangladesh had introduced an unique system of non-party caretaker government in the sense that the outgoing elected government actually steps down and an interim government is formed as a non-party caretaker government, making a distinction between the conventional caretaker government and a non-party caretaker government. The Bangladesh practice of a non-party caretaker government has its roots in the political culture of the country featured with mistrust among the political parties. Historically the elections held under the outgoing political government could neither earn the confidence of the political parties nor the people at large. Unlike other countries that have practiced the parliamentary system successfully, in Bangladesh the outgoing government in the past had manipulated the levers of power to rig the election to ensure its own victory. Non-party caretaker government has been the outcome of our political struggle over evolving a manipulation free electoral process. The crisis of creating congenial atmosphere in holding free and fair election was created by the political parties and the political parties had themselves came forward with the solution for overcoming the same through the constitutional process of “Non-Party Caretaker Government”. With such amendment, free will of the people for exercising their fundamental right of casting vote in the general election, has contributed to the establishment of democracy in its true meaning. The concept of non party caretaker government has been imbued with the value of democracy in the sense that it has been backed by people from all walks of life and was unanimously agreed by all the political parties. The 13th amendment as enacted by the parliament has been a product of political stress and crisis. Major political parties and also the small parties struggled for a system where all citizens, will have the equal opportunity to exercise his/her voting power to elect representatives of his/her or their own choice in the election of the parliament. What was experienced by the political parties and citizens of the country is that intimidation, coercion, undue influence perpetrated by the party in power hampered the normal process of election, the freedom of the citizen to express their will by ballot papers which ultimately gave a death blow to democracy, the basic feature of the constitution. The popular demand through long political stress and crisis was ultimately accepted and conceded to by the party in power representing the people of vast multitude and that led to the parliament to legislate the enactment, namely, the 13th Amendment Act. Theoretically also, it was based on the general will of the people as the peoples demand or popular demand was accepted and people agreed to adopt and practice the system as envisaged in the 13th Amendment. No segment of the people opposed it. It was enacted to consolidate democracy. It was introduced in the constitution to strengthen the democratic process, to achieve better democracy, so the impugned Act introducing the non-party caretaker government system was in aid of democracy as enshrined in the Constitution. It is an admission of failure, on the part of the elected governments, to conduct the elections fairly and honestly. While one might see this admission as downgrading ourselves, it can also be seen as a national strength and courage of being able to diagnose own problem and finding the way out. It is always expected to built a political culture of mutual respect and trust, however, we cannot withhold our democratic process until we reach that longed political culture. The non-party caretaker government system i.e., the Constitution 13th Amendment Act was first challenged in 1996. Two judges rejected the writ petition and observed as follows: “We find that no unconstitutional action was taken by the legislature and as such, we do not find any reason to interfere with the 13th Amendment Act”. A second Writ petition was filed in 1999 and the verdict was delivered on 4 August 2004 upholding the legality of Non-Party caretaker system of government. One of the judges observed: “If democracy is accepted as a basic structure of the Constitution, then free and fair election is also a part of it. Without free and fare election democracy can never be practiced in its true sense. So, it can rightly be said that free and fair election is an essential postulate of democracy and one of the fundamental aims of our society as enshrined in the preamble of the Constitution. It appears that 13th Amendment has actually strengthened and improved the system of holding free, fair and impartial elections by which the people can exercise their fundamental rights freely in electing the government”. The legality of the caretaker government at the Appellate Division of the Supreme Court began on 1 March 2011. The court heard the submissions of senior lawyer Justice T.H. Khan, Dr Kamal Hossain, Barrister Rafiq-ul Haque, Dr M. Zahir, former attorney general Mahmudul Islam, Barrister M. Amirul Islam, Barrister Rokan Uddin Mahmud, and Barrister Azmamul Hossain QC as ameci curae (friends of the court). Among them, all amice curae excepting Azmalul Hossain QC opined for continuing the caretaker government system. To our utter surprise, the Appellate Division of the Supreme Court, in May 2011 by a majority decision declared the 13th Amendment null and void and contradictory to the constitution forthwith but at the same time opined that the 10th and 11th parliament elections can be held under the 13th Amendment i.e., under the non-party caretaker system. The judges of the Supreme Court are yet to deliver full judgment but ironically the parliament has passed Constitution (15th Amendment) Act abolishing the non-party caretaker system. The decision of the judges was not unanimous but by majority opinion, the ratio of the opinion is even not yet known. Without a non-party caretaker system in place, the process under which democracy is practiced in this country, free, fair and independent election would be jeopardized. Because of the situation prevailing in the electoral process and massive use of power, muscle and money, incorporation of a new chapter by the way of 13th Amendment was necessitated for holding election freely and freely under the Non-Party Caretaker Government. If people cannot trust or keep faith on the partisan government or on the system of holding free, fare and impartial election then obviously an alternative is to be looked for. We therefore, find no alternative to that of the non-party caretaker system. It must be brought back in the constitution for holding free and fair election and thereby uphold democracy. Democracy becomes meaningful only when a person can cast his/her vote freely in a fair election. Thus, to practice democracy and to give it an institutional shape, it is imperative that periodic free and fair elections are conducted under the non-party caretaker government. In the absence of free, fair and periodic election democracy becomes meaningless. The concept of incorporating a non-party caretaker government in the Constitution, is by no means destructive of the concept of democratic government, rather it would help to consolidate and institutionalise the democracy in Bangladesh. The concept of a neutral caretaker government as desired by the people is a government that will be solely and exclusively committed to the empowerment electorates, free from fear and pressure of the muscle and money power, so that they can freely choose the government they want. The writer is Professor, Department of Law, University of Dhaka.